Imagine: An almondy, orange-scented buttery pastry case. A thick, smooth and decadent orange infused cream filling. 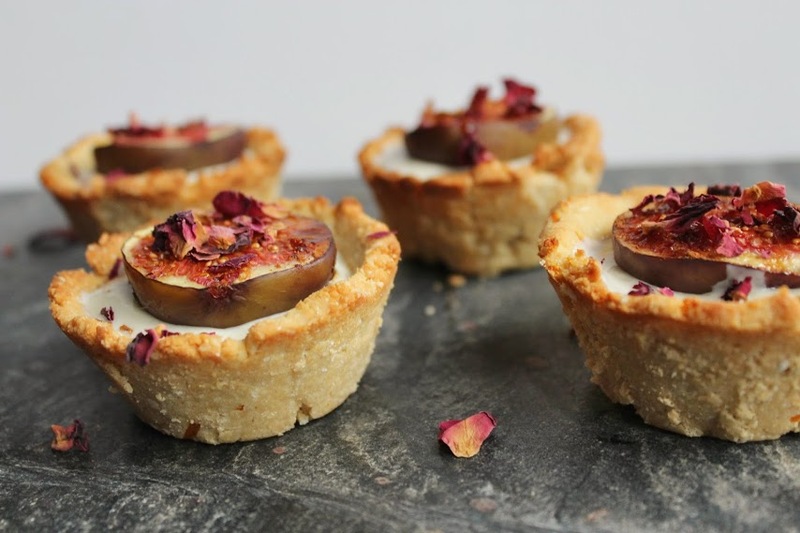 Topped off with caramelised, cinnamon roasted figs to go on top, sprinkled with aromatic rose petals. HELLO. Well, all that is a true story, as you’ll see from the recipe below. What’s even BETTER, is that everything described above is the result – but it’s all HEALTHY, too! 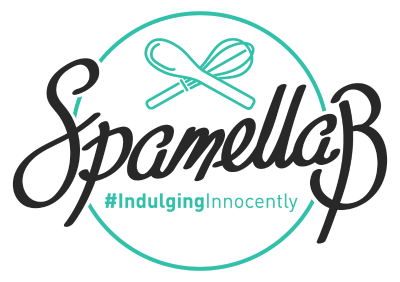 Trust me, if you like these flavours then this winter recipe is the one for you, and makes a gorgeous Christmas dessert for those who don’t like Christmas Pudding! Gluten-free, no added refined sugar and boosted with protein, you really can’t go wrong with these beauties! In a large bowl, stir together the flours, ground almonds, orange zest and cinnamon. Pour in the egg, softened coconut oil and honey/syrup/nectar and use a metal spoon to push and bind the whole mixture together to form a soft dough. Bring together in a ball, wrap up in clingfilm and chill for 10 minutes. Preheat the oven to 180 degrees C and grease a metal muffin tin really well. Divide the mixture into six and using your fingers to push the pastry into each muffin tin, ensuring the base and sides are evenly covered up to the top. Bake for about 10-15 minutes until golden and firm, then leave to cool completely. Simply place everything into a blender apart from the orange zest and whizz up until smooth. Stir in the zest, then pour the mixture into an air-tight container and keep chilled for at least an hour, to thicken. 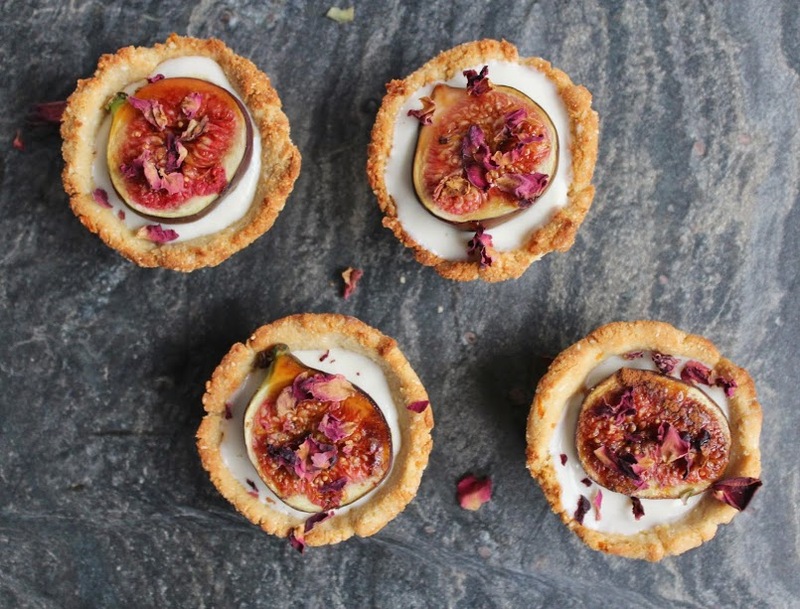 Meanwhile, roast your figs. Place in half and lay face up on a tray. Dot each one with a tiny blob of coconut oil, sprinkle some ground cinnamon over and drizzle the date nectar all over them. Pour over the remaining juice from the other half of the orange you used in the filling, then bake at 170 degrees C for about 15 minutes, until softened and starting to caramelise. Your kitchen will smell AMAZING. Remove from the oven and leave to cool. Now, let’s serve up! Gently run a sharp knife around the muffin tins and gently remove your pastry cases. If you greased the tins well, they should come out fine! 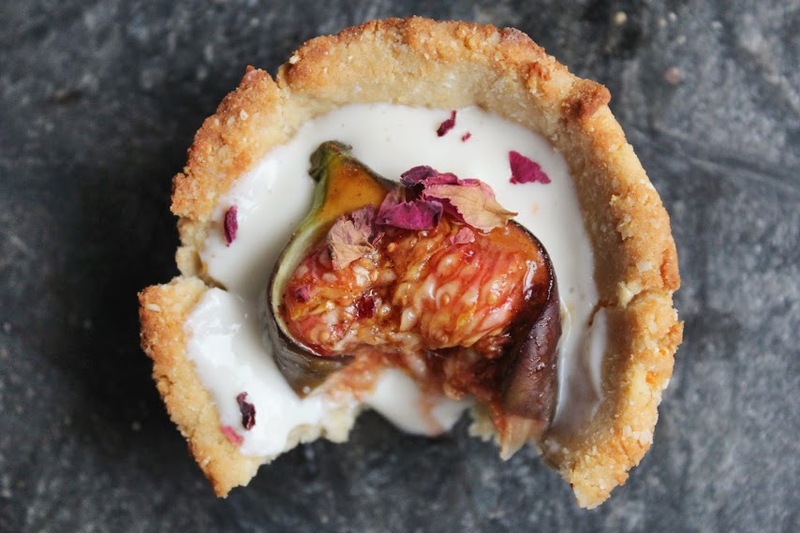 Spoon some of the filling into each one about ½ way full then place a fig half on top. Don’t worry if you have some of the cream left – serve extra with them! 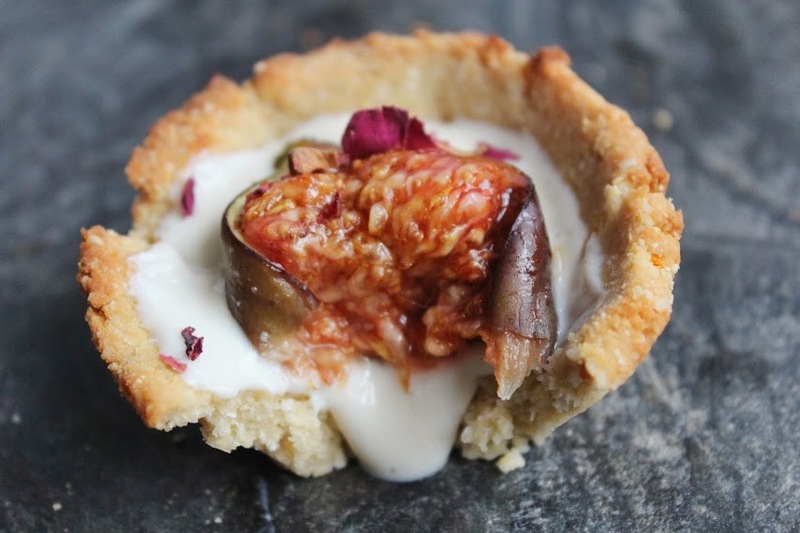 Scatter with dried rose petals if you wish, now tuck in!